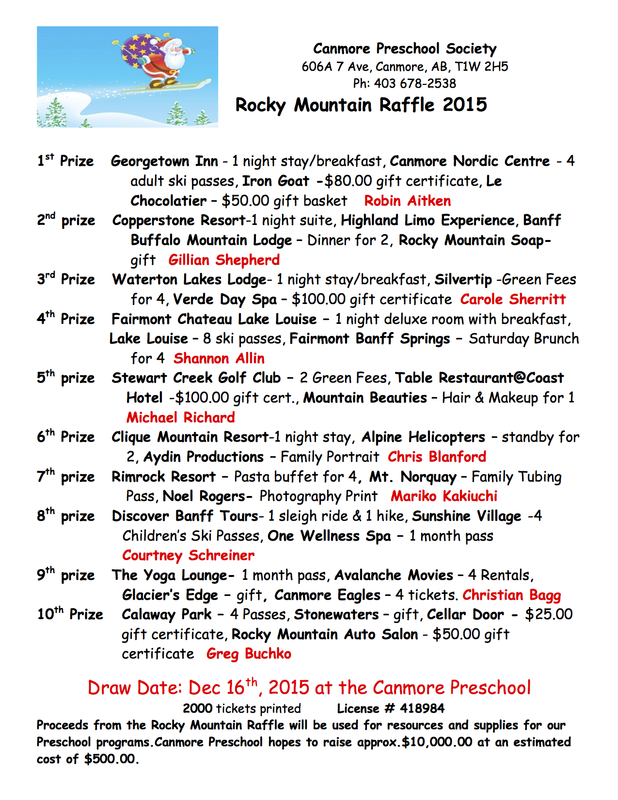 The proceeds from the Rocky Mountain Raffle will be used for resources and supplies for our Preschool programs. Canmore Christmas Artisans’ Market – Thank You! Thank you to all of the parents who helped to make the 20th Canmore Christmas Artisans’ Market such a huge success. It took many hands to put together an event of this scale and it was a great way to gather the community and celebrate the start of the holiday season. This year a record 3,800+ people came over the two days, and we raised nearly $18,000 for the Preschool! Thanks to all! The fire fighters can only give us one day to visit this year. We have 7 classes at Preschool. We are inviting the classes who do not normally meet on a Thursday to join us with their parents to visit with the fire fighters. 10:00am- Ms. Nataliya & Ms. Carmen’s 3 yr. old morning classes. We ask parents to join us at 10:45am to go outside to visit the fire truck. 11:00am- Ms. Nataliya & Ms. Carmen’s 4 yr. old morning classes and Ms. Carmen’s 3yr. old M/W afternoon class. Parents and children attend together for the presentation and fire truck. 1:45pm- Ms. Nataliya’s 4yr. old afternoon class and Ms. Carmen’s 3yr. old T/Th afternoon class. Parents please join us at 2:15 if you would like to go outside with your child to see the fire truck.